I would tell what is quite precisely described. On 9 of 10 Though there are mistakes. I will try to comment on some moments. On a photo Vaska cat is represented. One-eyed patriarch of the cat's tribe of the Hermitage. But there is an inaccuracy. Cats in the Hermitage never come into halls, and live only in cellars. Probably, he was given for a photoshoot there. Also have still turned such foreshortening that his odnoglazovost wasn't visible. The photo old - cats don't live so much, Vaska 12 as has died years. 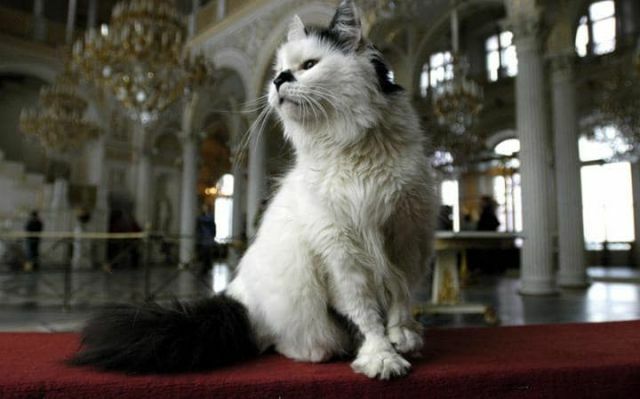 There was a short period when cats from the Hermitage were moved away. But then the great number of rats has bred there. Cats had to be returned. The icicles hanging from the gutters in Moscow in winter are so enormous that the pavements below are cordoned off - as they'd kill you if they fell on your head. There is such problem. Icicles are forced down from roofs by municipal workers. Owners of buildings with icicles are fined. But it is completely impossible to fight with them. And every year from their falling from huge height several people perish. At what happens and vice versa. Recently one worker who forced down icicles and has broken from a roof has died.